Recently I was asked if there was a service that allows businesses to receive text messages (SMS) to a centralized number. The answer is YES there is such a solution. However, these type solutions can be pretty costly. The solution I came up with is FREE. 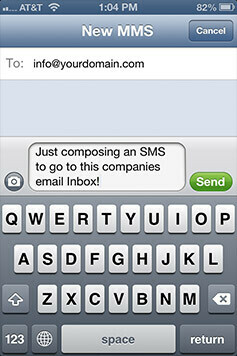 You can send an SMS (text) to any email address from any cell phone that has text messaging. Send an SMS (text) to any email address … simply put the email address into the TO: area of your SMS (text) message, compose the body how you normally would, send and the recipient will receive the SMS right into their email Inbox. You can even include photos and videos just like you would in an SMS of MMS! Certain businesses need the ability to receive information from various people who are on the run and don’t necessarily have access to their email accounts at that moment. This solution allows for those people to simply put the email address into the TO: area of a text and send it how they normally would. Additionally, there are times when several people within a company must have access to the received information and sending it to one person’s cell phone number or centralized number and then relying on that recipient to forward it to others can be a very unreliable method. For the company I implemented this solution, a new email address was created and the individuals handling the information receive it to their Inboxes on their computers, phones, tablets, etc. which doesn’t limit them to just receiving a text on their phone. The email should be set up as POP mail on all devices this way if Recipient #1 gets the message and deletes the message all the other receipts will still get the message because it is being handled through POP protocol as opposed to IMAP which syncs with all devices from the cloud.